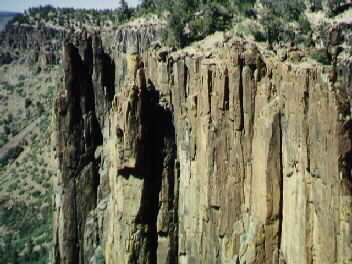 The following photos are from Salt River Canyon, about 50 miles north of Globe. This area is extremely rugged and very isolated. North of the Canyon is the great White Mountain Apache Reservation, while south of it is the San Carlos Apache Reservation. In many ways it can be compared to the Grand Canyon, but not as big. 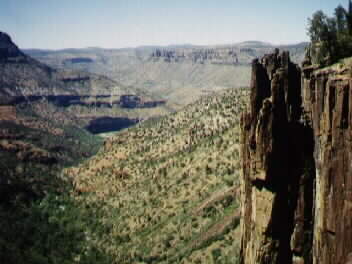 Salt River Canyon has spectacular vistas. 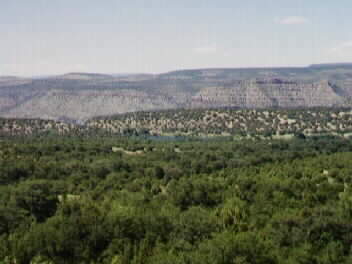 This is a view of Salt River Canyon from Seneca Falls, on the San Carlos Apache Reservation. When the creek runs, it is a very beautiful sight as the water cascades over these precipices. Another view of Seneca Falls in Salt River Canyon. In about the 1960s the San Carlos Apaches dammed up a small creek that passes through the tiny settlement of Seneca. 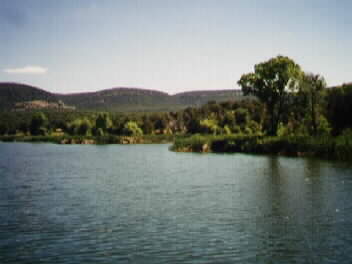 A small lake was formed, and it was hoped that it would be a recreation attraction. A small motel was also built in Seneca. Unfortunately, the motel was unsuccessul and is now boarded up (1997). Fishermen, however, still come to the lake to fish. Seneca is NOT named after the Seneca Indians of New York. It actually is an English corruption of the Spanish word "cienega," meaning "meadow." This is a long-distance view of Seneca Lake.